In October 2017, the World Bank released the Sharing higher education’s promise beyond the few in sub-Saharan Africa report, highlighting the rising demand and supply of tertiary education, along with disparities in access and economic payoffs across income groups. Sub-Saharan Africa saw the fastest growth in its tertiary gross enrollment ratio (GER) during 1970-2013 at 4.3 percent annually, faster than the global average of 2.8 percent. 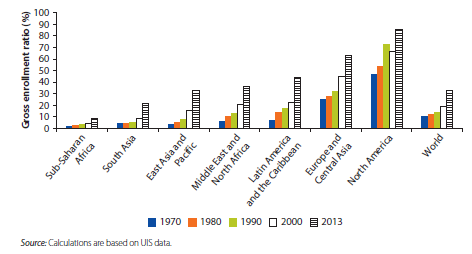 Even with this growth, sub-Saharan Africa has the lowest tertiary gross enrollment ratio globally, significantly lower than South Asia, which is second to last (Figure 1). This trend is primarily due to sub-Saharan Africa’s low base in 1970, when fewer than 400,000 students were in a tertiary education program. According to the report, the growth has been insufficient to match the rising demand driven by improved access to primary and secondary education, a growing young population, and employment shifting away from the agriculture to manufacturing and services. The rising demand for tertiary education has helped support rapid growth in the number private educational institutions. 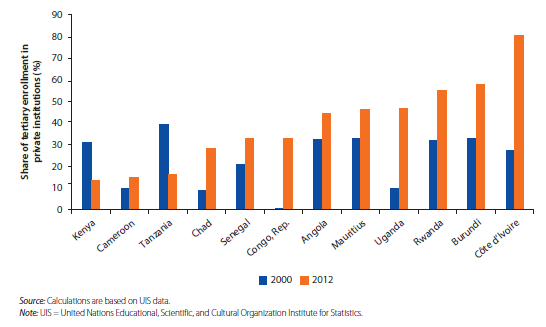 As Figure 2 shows, the share of tertiary enrollment in private institutions has risen in most countries with Uganda, Republic of the Congo, and Côte d’Ivoire seeing the largest jumps. The report highlights a few primary factors for the growth of private institutions such as the inability of the public sector to meet rising demand, privatization of public universities in some countries, the perception of higher efficiency at private institutions, and more labor market-driven training programs at private institutions. The supply constraints of public tertiary education are visible given that while the number of public universities grew from 100 to 500 between 1990 and 2014, private universities expanded from 30 to over 1,000, according to the report. Analyzing enrollment data at the regional level across wealth quintiles, the report finds that those in the top wealth quintile do better in tertiary education enrollment than those in the poorest and middle quintiles (Figure 3). Across regions, South and Central African countries perform worst in enrolling students from the poorest and middle quintile of households. Similarly, Figure 4 shows changes in post-secondary enrollment across a number of countries between 1998 and 2012 by the top 20 percent and bottom 80 percent income quintiles. During this time, the enrollment ratio for the bottom 80 percent increased 3.1 percent whereas the top 20 percent saw a 7.9 percent increase. 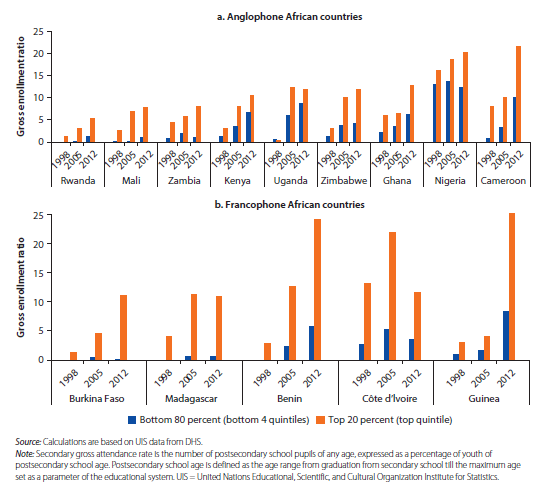 Interestingly, the report also finds that enrollment disparities by income are larger in francophone African countries and that disparities have grown at a faster pace in those countries than anglophone ones. The report provides policy recommendations that can help narrow inequities in the higher education system in sub-Saharan African countries. Focusing on wealth and income inequity, the report suggests improving financial aid programs to better target low-income students, extending financial support to private sector students, and incorporating socio-economic background information in the admissions process can improve access.